Branding was originally envisioned as a tool to cultivate and manage consumer demand in post-war America. However, it has evolved the power to not only inspire people to tell their own stories, but also to inspire people to engage with the world’s biggest problems. Branding is now wielded not just to increase sales or market share, but to change the world. The specter of nuclear war became the the most urgent challenge of the mid-60s. People felt hopeless and powerless: they could neither understand nor engage with the problem. To change this, Martyl Langsdorf created The Doomsday Clock - a simple branding solution which help people to grasp the true stakes of the problem and be part of the solution. It feels the same way today: the media is overheated with stories which many people don’t even think to be true. As a result, more and more people no longer understand the problems facing the world, and so do not know how to choose their way of engaging. Fear, blame, and withdrawal into the tribe became the default response. This is increasingly true for immigration in America. Is immigration a good or a bad thing? Does it steal jobs from US-born Americans or does it bring the smartest people from the world over to shape the future of the planet? The answers don’t seem clear anymore, and this ambiguity creates fear, mistrust and polarization of viewpoints. What if branding can offer a point of view, which won’t split people but unite them? My thesis project at the School of Visual Arts is an illustrative example of branding applied to social movements. We were tasked to reposition “immigration” from being seen as a “threat” to an “opportunity,” and immigrants from being seen as “the other” to just “another.” The solution was to reposition “immigration” and its relationship to American identity, which we portrayed as mutually inseparable and beneficial. US has a truly unique cultural identity. Unlike any other country on the planet, it is founded not on obeying the social station one is born into, but taking risks to transcend it, guided by the simple yet revolutionary ideals of the Enlightenment. All people are created equal, regardless their gender, skin color or who they love. People from all over should come together to create a new, prosperous society for all. Through the history of human evolution, we have been concerned with two main things: surviving and propagating our genes. When our ancestors lived in tribes they were drawn to people who were similar to them, because that usually promised a better chance of cooperation, and therefore, survival. “The other” -- anyone outside of that intimate core group, at that time, could mean a threat to safety, to prosperity and life. As society has become more sophisticated and interconnected, we have managed to enlarge the circle to include more and more (and more different) kinds of people. That is, until any situation of stress; it is at those points that we revert to our primitive instincts of labeling as “them” anyone who look and behave differently. How then has this ever been overcome? What has America done, in its history, to address this obstacle? By emphasizing the behaviors of people, not their appearance or history. It is much easier to build commonality with behaviors, and America has emphasized exactly this, as a country founded on transcending tribal history. Standing up for American values--taking risks to realize something that has never been before--has been, for centuries, the main requirement for having a place in the home of the brave. As it so happens that kind of risk-taking, and the it courage requires, are also exactly what you see in the immigrants who’ve been coming to America for centuries. To realize this strategy, we propose a non-profit organization called “United People of America,” which aims to unite people beyond their tribal identities. The mission is to celebrate the immigrant heritage of all Americans in the country, and to inspire all immigrants to be proud of who they are. We are all Americans. We are all immigrants. We are all Americans. We are all immigrants. Creating a social movement to recognize immigrants and the immigrant experience. 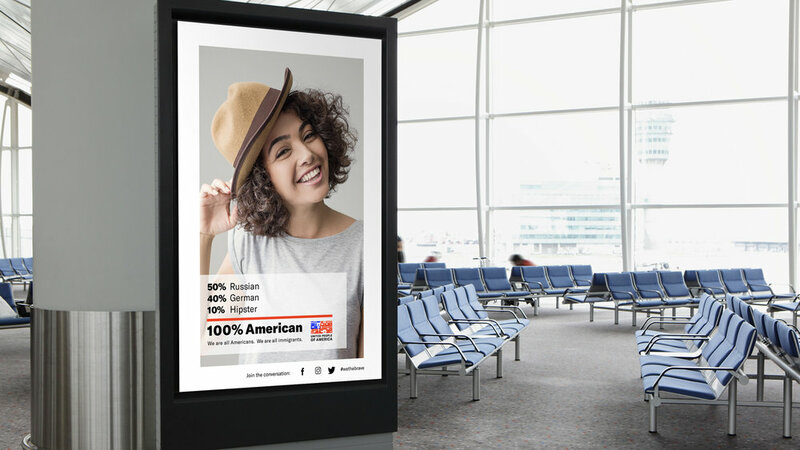 The “100% American” campaign will raise awareness about the cultural heritage of every person in this country by emphasizing the fact that everyone in the USA is of immigrant descent. It will feature people, landmarks and cultural icons, which were created by visionary and brave immigrants. For instance, the Statue of Liberty: made by the French, but now recognized as 100% American. Project United will be a brand partnership initiative that aim to spread the message and raise the funds to support United People of America. The campaign will showcase the importance of immigration to the American cultural identity by integrating the visual elements of “United People of America” to some of the most iconic American brands that were originally created by immigrants. For example, Levi’s was founded by a german immigrant and is now seen as an American icon. Brand Partnerships between United People of America and brands that were originally created by immigrants. 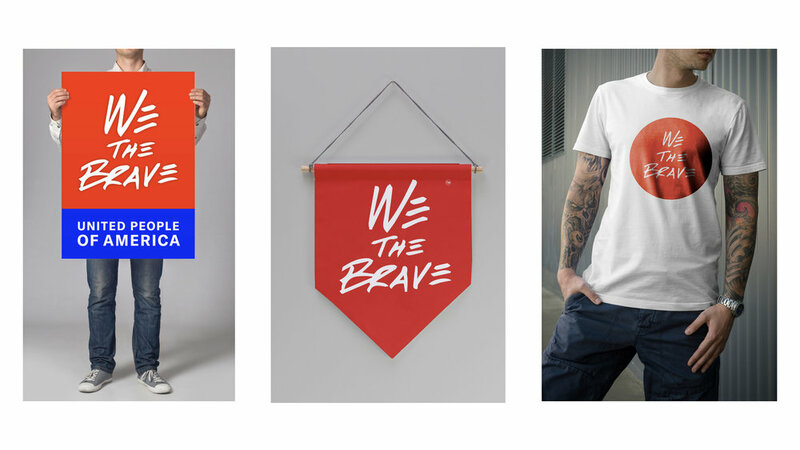 To encourage people to get involved with the cause, we will introduce We the Brave: an online and offline social movement, which will foster dialogues on the importance of immigration and immigrant experiences throughout US history, as well as celebrating their bravery and determination in living out American values. United People of America is the first step in giving a voice for those who have been silenced for too long. It encourages immigrants and their descendants to take back the power to write their own stories. This is a case study based on a project originally prepared and presented by students of the Masters in Branding Program at the School of Visual Art: Rosario Belli, Anisha Choudhury, Benjamin Havrilak, Namrata Kalani, Fabien Muenala, Pablo Ulpiano as a creative director, and myself, Julia Makhalova. Here is our presentation. We had a lot of fun working on it. Hope you will enjoy it too. This article was edited with the help of Tim Chi, M.A. (Psychology). Thank you!